Here's just a small sampling of the many projects the Kingston Improvement Association has been involved in yesterday and today. The Kingston Improvement Association has a long history of care of and advocacy for our Village's streets. 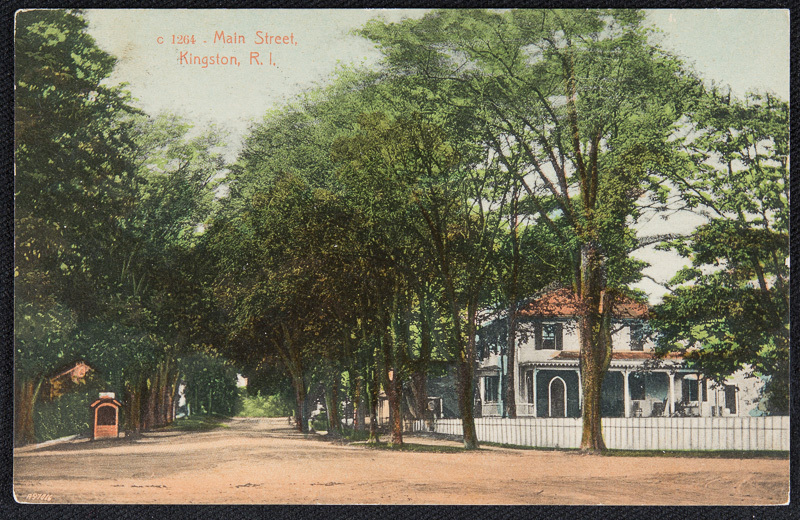 Some of the KIA's earliest projects were to place the first sidewalks in Kingston and to add shade trees, as can be seen on the postcard above. In fact, until 1922, the KIA was responsible for maintaining Village roads, which back then needed regular oiling to control dust. Today, KIA members are strong advocates for improving traffic safety and volume, as well as preserving Kingston's brick sidewalks and shade trees. The founding of the University of Rhode Island (then Rhode Island State College) was largely driven by KIA members. In 1888, led by Bernon Helme, the Town of South Kingstown and Kingston villagers joined together to raise the funds necessary to buy the former Watson Farm. Their efforts were successful, and the property was offered to the State of Rhode Island for the founding of its first state public college. Today, the KIA works to maintain and strengthen the University's relationship with the Village and its residents. For more than 50 years, the Kingston Improvement Association has made possible the annual Kingston Fair Day. Held annually on the third Saturday in May, the Fair highlights Kingston's organizations, its history and its community spirit. The KIA also plans the annual Holiday in Kingston event held the first Saturday of December, which is popular among holiday shoppers.